The nose has lychee and haystacks, with a hint of rosewater. The mouthfeel is thin with no cling. The body has lychee, lemon, banana and rosewater. The finish has lemon and lychee. Water brings out thin, rapidly expanding whorling that settles into streaks rather than mottling. The nose gains gooseberry and apricot, and loses the rosewater. The body gains red apples, apricots and barley water and loses the banana and rosewater. The finish gains apricots and red apples, and loses the lychee. Personal preference: I’d like a bottle. 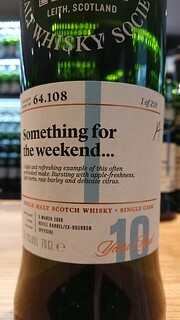 This whisky was provided by the SMWS in a preview session - thanks to them for that. Full editorial control has been retained in the tasting process.